Suriname, officially known as the Republic of Surinam, is a country in northern South America. It is bordered by French Guiana to the east, Guyana to the west, Brazil to the south and the Atlantic Ocean to the north. Suriname was first colonised by the British, and captured by the Dutch in 1667, who governed it as Dutch Guiana until 1954. The country of Suriname achieved independence from the Kingdom of the Netherlands on the 25th of November 1975. Suriname, the Netherlands Antilles and the Netherlands itself have cooperated on a basis of equality since 1954. 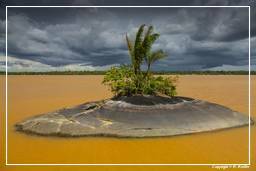 At just under 165,000 km², Suriname is the smallest sovereign state in South America (French Guiana, while less extensive and populous, is an overseas department of France). Suriname has a population of approximately 560,000, most of whom live on the country’s north coast, where the capital Paramaribo is located.